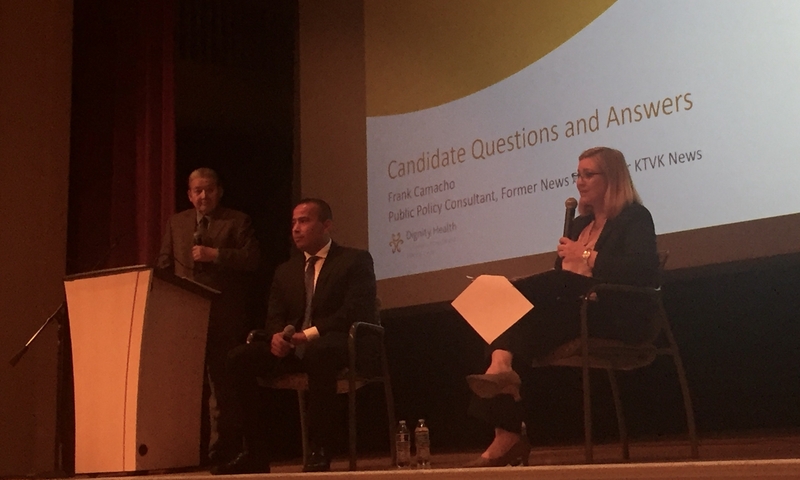 Kate Gallego shared examples of existing programs she’s worked on that would continue to guide her policy on housing and services for homeless people, while Daniel Valenzuela centered the discussion around his personal experiences with housing instability as a child during a mayoral forum on health, housing and homelessness Tuesday. Both stressed that, as mayors, they’d be partners with stakeholders interested in solving the housing affordability and homelessness crisis. Before the discussion with Gallego and Valenzuela began, Michael Trailor, director of the Arizona Department of Economic Security, and Brandon Clark, president of Circle the City, gave presentations. Trailor said there’s an estimated 10,000 people who are homeless in Arizona. Since 2014, the number of unsheltered people has grown 149 percent from 1,063 to 2,618 in 2018. He drew connections between the imprisonment of people with mental health illnesses, the lack of affordable housing and the costs on health care providers who respond to chronically homeless populations. Clark called on people to vote for leaders who share a sense of intolerance for the crisis. The event was held in central Phoenix and organized by the Arizona Housing Coalition, Vitalyst Health Foundation and Dignity Health, the hospital network. During the forum, Gallego said homelessness “is the biggest social service issue facing our community,” and stable housing is the main component to solving it. Valenzuela’s overarching take throughout the forum was to focus on individual needs. He told the crowd that his family moved often while he was growing up, and was evicted several times. On the topic of Phoenix’s high eviction rate, Valenzuela said the people who are affected need to be at the forefront. In his mother’s case, the reason for eviction was sometimes a utility bill, domestic violence or lack of job training, he said. Valenzuela also highlighted a particular population during the discussion: homeless youth, who are mostly LGBTQ. “I would be the mayor to aspire to end youth homelessness,” he said. Gallego said she’s an “advocate for mixed-income communities” and supports incentivizing affordable housing developments. She also wants to use city resources to partner not just with non-profits but also with health care providers willing to fund beds for people who are experiencing homelessness and who recently underwent surgery or trauma treatment. Gallego also offered a decentralized view of servicing the homeless population, one that involves other cities addressing the issue and isn’t just focused on the Human Services Campus near downtown Phoenix. “We shouldn’t concentrate poverty,” Gallego said. There should be more treatment centers and more beds located throughout Maricopa County, she added. On how law enforcement deals with the homeless population, Gallego said she wants to see more money invested in crisis intervention teams, which are trained to respond sensitively to specific populations — like people with autism and mental health conditions like dementia and schizophrenia. She added this training should also go to prosecutors and others in the municipal court system. Valenzuela, who’s been a firefighter for 16 years, said law enforcement “are not social workers.” He proposed “bringing innovation to the table” and offered the idea of a mobile app first responders can use to figure out what resources are available for individuals they encounter with different needs. Gallego was the top vote-getter in the four-person race in November, but at 45 percent of the vote, she didn’t reach the majority needed to win outright. Valenzuela finished a distant second, with 26 percent of the vote. Phoenix will hold elections March 12. District 5, which covers west Phoenix, and District 8, in south Phoenix, Laveen and parts of central Phoenix, will also elect a representative. The deadline to register to vote for this municipal election is Feb. 11. To register to vote, visit servicearizona.com. To check if you’re registered to vote, click here. In-person early voting will be available from Feb. 13 to March 8 on the 15th floor of Phoenix City Hall. Gallego’s campaign has raised $1.8 million this election cycle, while Valenzuela’s has raised $1.2 million, according to the latest campaign finance report from mid-January. Great Report of the forum! Keep us posted ! Thanks Johnny .